Back to school is a busy time for parents, preparing their kids for the classroom, fall sports and other activities. Choosing a new phone and managing cell phone use is also at the top of many parents’ list. Kids nowadays use phones as one of their main forms of communication with other kids as well as pesky parents who pick them up and drop them off places. I covered the topic of deciding on the right age to buy a phone and tips on setting up your kid’s first phone in a recent back to school post. I drove to the AT&T store myself to try to figure out which phone I was going to buy for my twin boys who are starting middle school. After receiving an email about the Pantech Vybe, I decided to do a review of the phone with my twins. As I mentioned in my “tips for buying your kids a phone” post, I believe phones should be given to kids on an as-needed basis. My kids are taking the bus, riding their bike or walking to school and activities on their own now we decided it was time for them to have their own phones. Because they are just starting middle school, I just wanted to have the ability to call, text and use phone tools while not using any social network or the mobile web. The Pantech Vybe is a great first phone because in addition to making calls it has a slide out keyboard that’s perfect for texting and has its own operating system so kids can’t use app stores to load up on apps and games. We also found it helpful to have the option to disable data on the phones if necessary. Of course at first we the kids pushed back. They wanted an iPhone or another fancy smartphone like some of their other 11-year old friends. Beyond being RIDICULOUS that 11 year olds have full featured smartphones in the first place, tweens especially may not understand the consequences of all of their actions – so why give them mobile tools to do so? We do believe as a family that all kids should be educated and make informed decisions about Internet safety but temptations and peer pressure can be hard for tweens/teens to resist. Already one of their peers is posting things on Instagram that are pretty alarming for their age group. While many kids have full access to browsers and apps on tablets, desktops and laptops at home – at least those devices are being used at home and not being taken with them every day and used without supervision. The user manual has information on setting up and also found the Pantech support section of the AT&T website useful because of the setup videos. What I found useful to understand is that there are two types of “menus” in advanced mode. The main menu is called the home screen (starting point for using applications on your phone) . 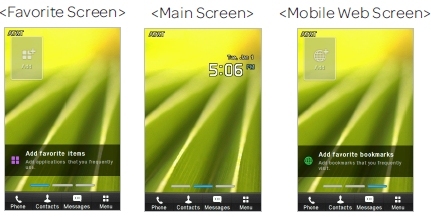 The home screen can be customized with a picture or standard backgrounds (customizable from “display” section of tools). One of the home screens can be customized to display shortcuts for favorite apps (Max 9 icons can be added) and another for web addresses. Once the main screen is set up it is simple to use the phone (unlock, tap and go). The second menu is listed on the home screen in the navigation at the bottom as “Menu”. This has access to load lots of different tools (more than the 9 max on the home screen). In the tools area we loaded shortcuts for pre-loaded apps such as sketch pad, notepad, calculator, alarm clock voice memo, pictures, address book, video player, and camera. The “My stuff” folder has applications, games, audio (alert tones and ring tones), music, pictures, video, other files and info on memory. Available games include brain challenge and UNO (we bought the full version of Uno). You can insert a memory card if you wanted. For kids who do have data plans there is a video player and for those who want to load music there is a music player. The help section of the website has instructions on how to transfer music to the Pantech Vybe. What I like about the Pantech Vybe is that it does not have access to an app store so kids are limited to what is loaded on the phone. As I said in my “getting your kid their first phone tip post”, having access to app stores can be expensive and give access to inappropriate apps for kids. While the Pantech Vybe does have Facebook, Twitter and mobile web apps – I explained to my kids that we blocked the data plan so they can’t use those apps anyway. Along with the other apps, the Pantech Vybe has AT&T services apps preloaded such as like AT&T Navigator, AT&T Address Book, AT&T Family Map, AT&T Drive Mode and myAT&T so I can help them see their account information. The specifications have the phone at just 4.94 ounces so it is light for the kids to either carry in their pocket, bags or backpack pockets. It is also slim at just 2.32 inches width and 4.49 inches height (depth is only .51). The 3.2″ TFT Touchscreen Display has nice resolution (240 x 400) for a first phone and the touchscreen makes it more intuitive to use. Calls made to my sons on the phone sound great. I am able to hear them clearly and they have been able to hear me (even if they don’t want to!). The proprietary operating system (Pantech Proprietary J2ME) gives me comfort that they can only use the apps pre-loaded on the phone. The Pantech Vybe has cellular technology to meet my kids need (2G – Quad Band (GSM/GPRS/EDGE) – (850/900/1800/1900 MHz) 3G – Tri Band (UMTS/HSDPA) – (850/1900/ 2100 MHz) and Bluetooth if they want to use it with wireless accessories. “Purchasing your child’s first mobile phone has become a rite of passage for tweens and young teens, and parents too. The big question looms: Is your tween ready for a cell phone? The Pantech Vybe is a great compromise, offering your child plenty of must-have features like messaging, easy camera access and social media without unrestricted access to apps and a high data plan. The Pantech Vybe is your solution. The Pantech Vybe is an affordable, easy to use quick messaging phone, with access to the features and apps kids want at a price parents love. With a low-cost monthly plan for talk and text, the Pantech Vybe is an attractive option to add to a family plan at an affordable price. In addition to being budget-friendly, the Pantech Vybe is tween and teen-approved with a slide-out keyboard for quick and easy texting, social media shortcuts, quick camera button, multiple customizable home screens and music and video players. The Pantech Vybe is $29.99 with a two-year contract and can be purchased exclusively at AT&T. For more information on the Pantech Vybe, visit MyFirstPhone.com”. Disclosure: I have received products for review purposes.